Kokonoe Yae is a swords(wo)man in training. She comes from the Eashen Empire. Her family is known for its warriors and she tends to follow that tradition. To fulfill that, she has to become stronger and thus travels around the world. 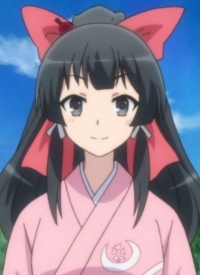 She first appears in episode 2 of the series and after watching Touya helping others, she decides to stick around with the party. She is always wearing traditional Japanese sword user’s attire and has two swords with her. She is shown to have a huge appetite. Der Charakter Yae KOKONOE stammt aus einem Anime, den Du gesehen hast? Dann fülle unsere Screenshot-Datenbank mit Bildern dieses Charakters, denn manchmal sagt ein Screenshot mehr als tausend Worte. Nutze zum Hinzufügen der Screenshots einfach unsere Eintragsmaske. An dieser Stelle würden wir Dir gern eine Auswahl verschiedener Merchandise-Artikel zum Charakter „Yae KOKONOE“ anzeigen. Du kannst aniSearch unterstützen, indem Du Merchandise-Artikel zum Charakter „Yae KOKONOE“ mit der Hilfe unserer Eintragsmaske hinzufügst. TV-Serie, 12 (2017)In Another World With My SmartphoneProduction Reed Co., Ltd.